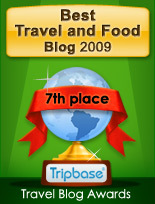 Enjoy - Food & Travel: Instant gourmet essence! There are few ingredients that may create an instant touch of gourmet taste to a dish. One is a small bottle of oil infused with white truffles that I buy at my local supermarket. It is a culinary magic wand that lifts soups and sauces from good to fabulous, with one light touch. I discovered the marvel of truffle infused oils, when a friend bought me a bottle as a gift. In spite of its size, I can assure that a few drops of the white truffle essences go a very long way. This small bottle, is a good investment for those who like to prepare good food. I have, with great success, added oil to soups and sauces that have been promising, but where I have not totally succeeded to find the right balance. Later, at the meal, you always get that baffled expression in guest's faces, as they sense the truffle aromas, and they end up asking; What is that taste…..? I have one personal favourite. When I was served Soup with Jerusalem Artichoke with smoked duck breast and white truffle oil, I ascended to culinary heaven. The nutty, sweet taste of the root, the smoked salty duck, the rounded taste and velvety texture from double cream, and the truffle – you just have to try it!! You will find the recipe below. I indulge in these drops, added to freshly made soup, when served, and due to the pungent truffle aromas, not much is needed. 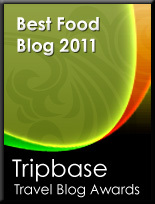 I know that one should not share culinary secrets, but this one is too good to be true, and is true. Run out and try it yourself, and let me know whether you agree. 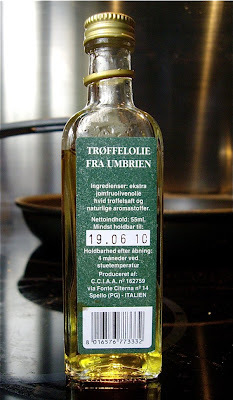 In Norway this truffle infused oil, produced in Umbria by Tartufi di Paolo, is available in well stocked supermakets priced at around NOK 60 or around 7 EUR. readers.Thank You for sharing.. Keep up the good work..